Equipment – Our disco lighting equipment and sound systems have the clearest sound with the right punch, giving CD clarity and not just a lot of noise blasting the crowd’s ears, whilst all of the time being played at the right level to suit your party. Bands have two settings, ON and OFF. This is not the case with ourselves, we pride ourselves on playing music at the right level. 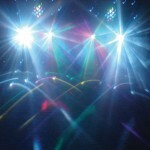 The-wedding-Disco is careful that a quality sound is produced, along with a fantastic light show. Which will set a right atmosphere for your night. Dj Skip does not feel it necessary to play at such a volume that will damage your eardrums, or upset elderly relatives. The level will be comfortable for all to enjoy. Skip Alexander’s has been a wedding DJ in Belfast for many years. 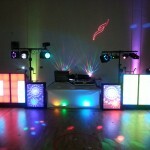 His energy and confidence at weddings and birthdays is what sets him apart as a professional DJ. 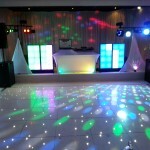 We believe that our colourful discos are as important as sound to help make a great-looking party atmosphere. Our lighting package and rig is regarded as impressive, it is NOT a couple of boxes of lights and a strobe blinding your guests. This lighting show is large and colourful. Luckily kam have brought it right up to date with this fully dmx controlled led light screen. Over a thousand ultra bright coloured leds produce stunning built-in patterns to keep your guests dazzled. They are ideal for creating a focal point to the centre of our mobile rig. We use only the finest music systems, giving you the best sound for your event. 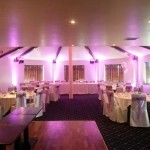 We have 3 systems all suited for different sized rooms & different size of crowds. Bose L2 – double base capable of small to medium rooms or crowds. Its like having a string quartet sitting in close proximity to you. 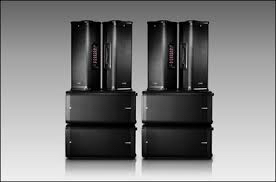 We use a speaker system called Line 6 consisting of tops and base units. Supplied by Rea Sound in Cookstown. These speakers delivers a great sound every single time and very portable. Easy to set up with minimal fuss.